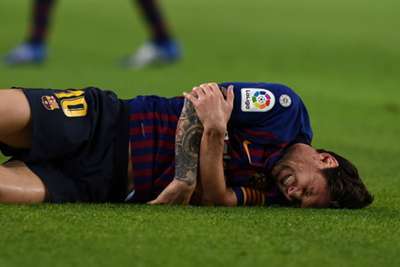 Lionel Messi was replaced in the first half of Barcelona's LaLiga match against Sevilla with a concerning arm injury, placing his Clasico participation next weekend in doubt. The Argentina superstar scored Barca's second with a gorgeous 20-yard finish after a swift breakaway in the 12th minute, but he fell awkwardly soon after in a coming together with Sevilla's Franco Vazquez. He was given medical attention for several minutes on the touchline, with Barca's physios putting a significant amount of strapping around his right elbow. Initially it looked as though he was going to attempt to carry on, but after having his arm tended to, he laid back on the floor looking resigned to his fate. He soon trudged away and down the tunnel, with Ousmane Dembele replacing him. It could be a particularly crucial injury given the importance of Barca's upcoming games against Inter in the Champions League and Sunday's El Clasico clash with Real Madrid. Messi is Barca's top scorer so far this season, with his first-half effort against Sevilla his seventh in nine LaLiga outings.